Withering away in The Jackson Cage? Well I not exactly this far gone but there some pretty bad side-effects of the always-on internet life. As a lecturer in almost impossible to ‘switch-off’ from the always on environment. Students are online on facebook and twitter and I actually push them into the ‘online’ life. But there are significant downsides. Soon it will so encompassing that I will only move once a day to ingest food (still a requirement) despite everything the web can do….not good healthwise. It a good job I still have to physically meet student body (despite e-learning ventures) or I’d probably lose use of my legs. The enveloping nature of the internet means that everything we, see, do and think is processed through a web lens and recently I have noticed this happening to friends of mine too. Facebook is a dominant force in shaping the local arts groups events and actually channelling local arts debate. Like mobile phones what did we do before facebook…talk…ring…email…make posters…thinking back to my pre-internet art school how on earth did things happen at all? Happen they did though as my Alumni group on facebook for Hornsey College of Art attests.. In writing this blog entry I will have a fairly constant online ‘audience’ through facebook and virtually everything I currently mulling over is now appearing as links on facebook or twitter or both. This can be useful as a kind of strategic bookmarking but instead of being personal and private it is open and capable of endless revision….in fact holding a fast opinion seems to be becoming ever more difficult. This can have unexpected bonuses but also problems arise. A factual mistake…e.g. did I really imagine a Ceramicist won the Nottingham Open show becomes a hard fact that has to be retracted. Private opinion is spread so quickly that it becomes more than a blog note and a career defining standpoint. Where is the boundary between a provisional and a fixed opinion. Or is that where we now stand in endless revisionism territory? The price of spectacular connections across continents and time is a fluctuating lack of finality in artworks and strength of opinion. In a web that always on and always in a sate of flux these things become expendable. 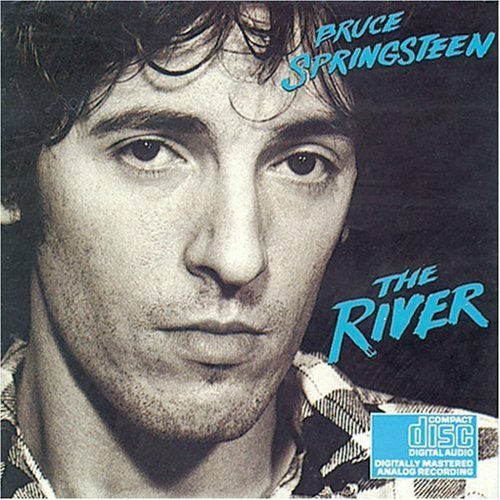 Springsteen’s album becomes simply a stream of out-takes, alternative album shots, a flood of all the mistakes he made as much as an album. Finality and craftsmanship becomes a negotiable stream. Today through twitter/facebook I became aware of a live performance of songwriter Tom Russell. Did it change the perception of the song because in a new context. The fixity of art-forms is lost. All very post-Derrida the academics would scoff..but it happening. How do young people hold an opinion in such mutable environments? This is the real price of never-ending revisionism. The real artefact becomes lost in a fog of ‘versions’. I love to touch a vinyl album and remove the actual ‘sculpted’ object. 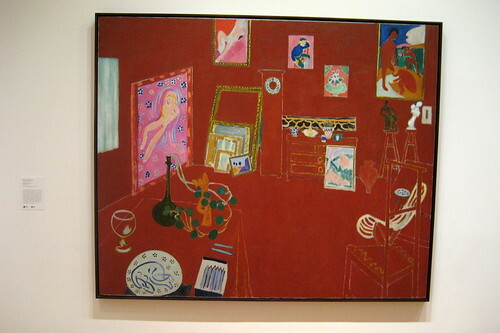 I remember sitting and staring at Matisse’s Red Studio painting when on loan to the ‘old’ Tate. I love this private photo I found on web (there are thousands of version sof this image in a range of hues) as it reminds one that no reproduction can supplant actual viewing. More than simple cramp I feel that the internet has supplanted all the physical artefacts I once held dear and like the proverbial bathwater what have I and by extending the metaphor ‘we’ lost? I cannot put a finger on it yet but as I see students in our local tea shop flicking through positions and networks on their macbooks I feel a nostalgia for a pre-internet time of certainty and argument away from the shimmering stream. Oliver Reed banging his fist on the wooden table in a mock Parisienne cafe in Tony Hancock’s ‘The Rebel’ was a cliche but it feels more real than current debate. I can talk to everybody at once but really I am addressing no-one but mysefl in a loft space on a cold, dark winter night. Reality exists beyond the screen but somehow I have lost touch with it. Maybe if the web splinters it may not be a bad thing. Content will start to re-assert itself as ‘definitive’ once again. Maybe people will read the same version, listen to the same song. This endless variety flowing across the screen will start to slow down and we will all have time to concentrate instead of time to be distracted. To make art at this juncture is to my mind impossible. We are looking at the remnants of art-forms post-internet. We seek out the novelty, the half-finished..the mistake. With no fixity one cannot create anything but a blur? I am simply adding to the blur at present. I seek the fixed stare..a Ruskinian calm maybe and then I can proceed. Artists at present are like so many sparrows flitting through the halls..which will survive to next summer and which will smash against their own reflections here? Next Next post: Saatchi online …really?? ?..you having a laugh?